Editor’s note: Updated September 2018. Social media is the most powerful form of digital persuasion. From a distance, some people view it as mindless scrolling, but engaged consumers use platforms like Instagram, Facebook and Twitter to inform their purchasing decisions, qualify brands’ trustworthiness and form tight connections with those whom they regard as a community. 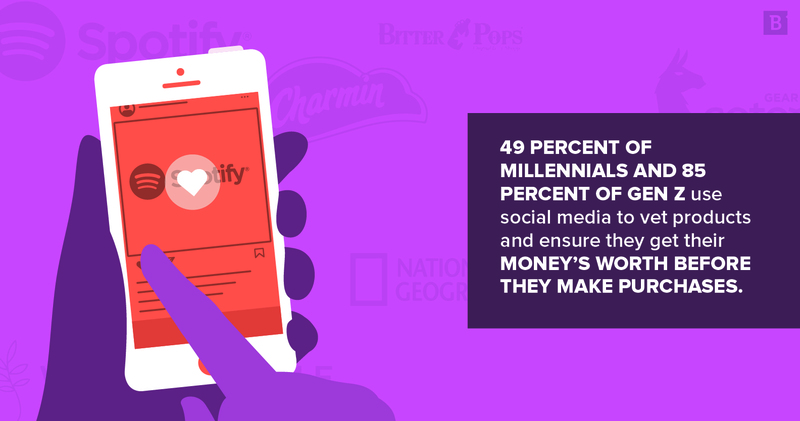 And younger generations – 49 percent of millennials and 85 percent of Gen Z – use social media to vet products and ensure they get their money’s worth before they make purchases. As PwC put it, social networks are the primary way consumers determine what to buy, not just where to buy. Social media (37 percent) outranked retailer websites (34 percent) and price-comparison sites (32 percent) in terms of which media channels consumers place their trust in. In this way, social platforms are more than just followers, fans and photos; they’re intrinsically enmeshed in the buyer journey. In selecting which brands we think have dominated social media so far in 2018 we opted to feature those that have unique characters and aren’t afraid to connect with consumers in unlikely or off-the-wall ways. 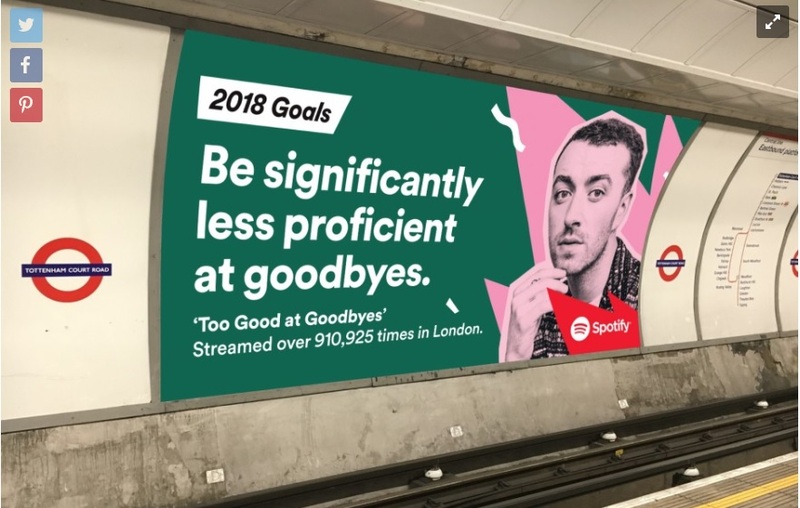 Spotify used its in-house creative team to pump out an innovative cross-channel campaign to kick off 2018. 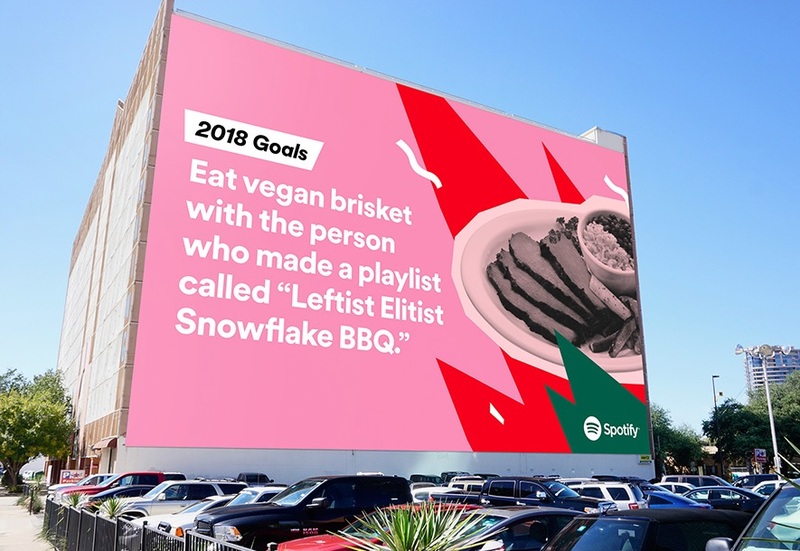 Dubbed “2018 Goals,” Spotify mined the search and playlist data of its user base to develop thematic, branded ad experiences on billboards in 18 markets around the world. Spotify’s data-driven approach combines the best of digital analytics with the physical ad space of public areas. Ads were featured on the sides of buildings, in subway platforms and along busy streets for maximum visibility, with the added benefit of the artists themselves – and their fans – taking selfies in front of the billboards and posting to their social profiles. This created a cyclical effect: digital data taken offline for physical advertising then brought back online by users. In 2016, Instagram began experimenting with integrated shopping features on its platform. After seeing early success, the update was rolled out more broadly to apparel companies with Instagram profiles; later in 2018 the “Shopping” update became available for non-U.S. brands, too. Wayfair, a home decor company, was quick to adopt this new form of commerce. Their subsequent campaigns promoting their products across social were a thing of beauty. 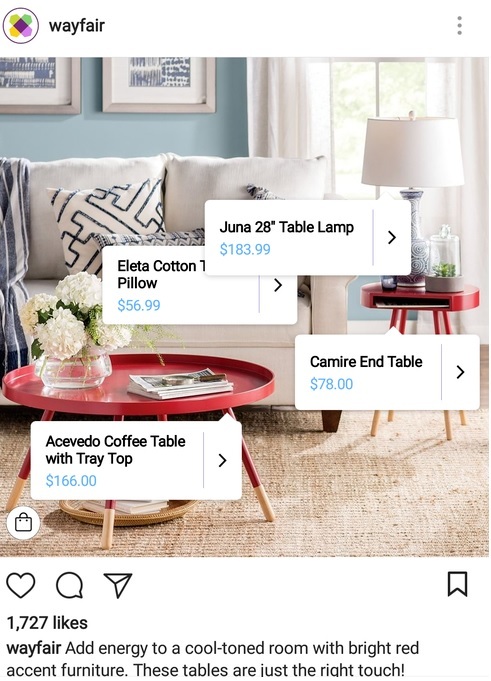 Rather than placing paid ads on Instagram and hoping for users to click, Wayfair transformed its checkout process by capitalizing on the Shopping update features that automatically tagged products featured in Instagram photos and affixed a price tag and a way to purchase items. 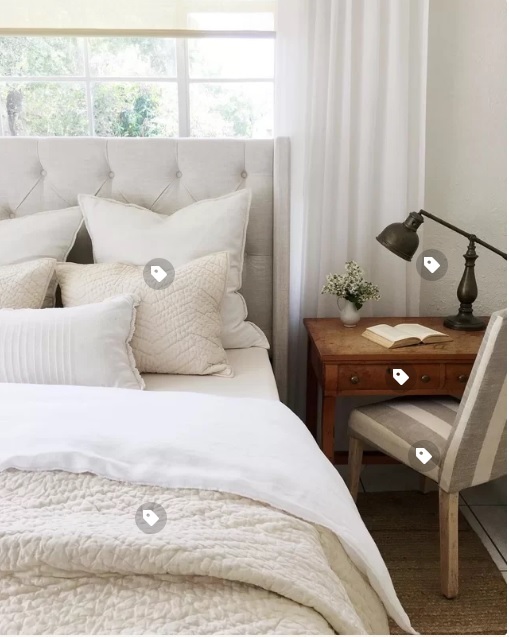 When users scroll through Wayfair’s feed they find staged, at-home settings that include furniture for sale. All users have to do is click on the product popup box, tap “Shop Now” and be directed to Wayfair’s checkout page. With just a few clicks, social media users have organically navigated from one site to the next and completed a transaction, a frictionless process the likes of which have never been seen. 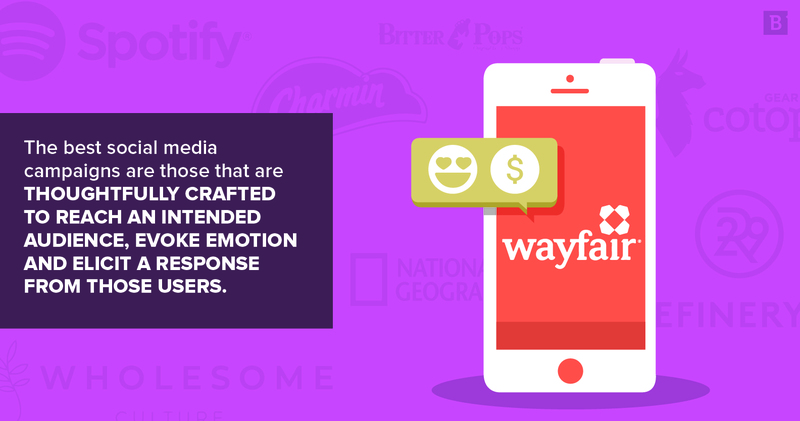 Wayfair’s ability to integrate this new feature into their social media strategy led to a three-fold increase in traffic coming to their site (via social channels). Wayfair is a nice example of brands understanding the power of social media, all the more so for ecommerce companies. There’s also the fact that Instagram as a platform effectively remade a portion of Wayfair’s business model for them, and Wayfair was savvy enough to recognize it. This speaks to the need for brands to experiment with new technologies and retail capabilities, as well as creating content that’s optimized for specific social channels. The presentation of content – in this case home goods – matters just as much as the actual content itself, and Wayfair proved this point through its professional photography, artful staging and seamless checkout process. No one tops Charmin’s Twitter game. For years, Charmin’s social media prowess has been the stuff of legend. In 2014, Time Magazine called them the “sassiest brand on Twitter,” and they’ve kept up their image ever since. Charmin understands their audience like few brands do, and they’re not afraid to revel in toilet humor. Charmin runs small-scale hashtag campaigns, like #tweetfromtheseat, but what works best for their brand is consistency and tone. They’re funny, witty and quick to co-opt holidays (National Splurge Day, National Poetry Day, World Compliment Day, etc.) for their purposes. It may be low brow, but it’s effective for engagement. As consumers grow more scrupulous in who they buy from for ecological, political and ethical reasons, entire business sectors have adjusted their brand messaging, supply chains and product quality. The fashion industry, for one, has seen a shift toward higher standards of material sourcing and treatment of workers. Wholesome Culture, a clothing retailer, exists to sell “ethically made” clothes, promote a cruelty-free lifestyle and donate 15 percent of profits to animal rescue organizations. Naturally, Instagram has become an important podium for broadcasting these values to the world. While you’ll find branded tees and other products featured on their Instagram feed, you’ll also come across topical memes, healthy eating tips and plenty of beach vibes. What this accomplishes is a larger focus on lifestyle in general, rather than merchandise alone, presenting a wider palette of content with which users can engage. Wholesome Culture uses social media to drive engagement, not necessarily to push products. The key, however, is that all of the content they post remains on brand from an audience targeting perspective, regardless of how tangential it may seem on the surface. Just think, people who are interesting in buying cruelty-free apparel are mostly likely intrigued by cruelty-free lifestyles and communities that support cruelty-free environments. Wholesome Culture caters to this audience with an array of content that operates laterally, outside of the traditional sales funnel where leads are all driven toward the bottom of the funnel. And it makes sense. Social media doesn’t have to be about leads and transactions – sometimes it’s just about the content and the experience. You don’t have to be a huge company with international name recognition to launch creative campaigns. Case in point: Bitter Pops. As an “Original Beer Shoppe,” Chicago favorite Bitter Pops has thousands of rotating craft beers available for purchase individually, as a pack or in takeout growler form. But that’s not all. They also run several events-based marketing campaigns each month that include in-store yoga taught by professional instructors, with proceeds going toward local charities and causes. And they operate an ancillary Instagram account under the moniker “Bitter Pups” where followers post photos of their doggos in store. This user-generated content adds a very personable, accessible touch to the Bitter Pops brand and further encourages repeat visits for the sake of the photo op. You may not be a huge beer fan, and you may not live in Chicago, but you almost certainly become giddy looking at little pups. By rounding out their brand image to encompass characteristics beyond alcohol, Bitter Pops makes a real connection with their online community (and their physical neighborhood community). They partner with adoption shelters, exhibit at local farmers markets and keep their brand logo (and courtesy tote) ever present. This isn’t a gimmicky marketing ploy that just piggybacks off of K9 love – at their core, they have amazing offerings, great in-store deals and a passionate base of supporters irrespective of their social media. Their online presence simply makes them even more presentable and congenial. And that’s a lesson every brand can learn. Outdoor apparel brand Cotopaxi is all about the visuals, which makes for great marketing. They also lean into their brand messaging, promoting a positive impact on the environment by using scrap materials in their clothing, allocating 2 percent of their revenue toward alleviating poverty and working with health and education foundations throughout South America. Their ongoing #gearforgood campaign features Instagram users organically showing off the Cotopaxi brand in various outdoor environments. Cotopaxi’s connection with their social media followers is founded on human experiences in sometimes extreme conditions: the long climb never thought possible, the 110-degree day that pushes you to the limit. Along the way, Cotopaxi is right there, too, with vibrant colors, great products and social platforms on which users can share their adventures. Iconic photographs and daring visuals are National Geographic’s forte. In addition to amazing content published by the Nat Geo staff and their followers via Instagram, the company also has an exclusive photo community through a subdomain (with its own Insta, too). Known as “Your Shot,” photographers sign up, submit their photos, comment on others’ work, curate photo narratives thematically and even qualify to go on assignment in tandem with Nat Geo experts. Once a week, the editors of Your Shot choose their favorite 12 images and feature them on their blog and social channels. Top Shot: Pose for a Family Photo | Photograph by Jens Svendsen (@svendsensfoto) . #YourShotPhotographer Jens Svendsen spent two days with this family of musk ox in Norway to find the perfect moment in the evening sun to make their photograph. Your Shot Producer David Y. Lee (@davidylee) writes, “I agree with #YourShotPhotographer Nicholas Paoni who commented, ‘The light and clarity of this shot really are amazing. I am also attracted to the frame by the subject, which I will likely never see in person, so your rendition of these amazing animals is much appreciated. But it is the eye contact with so many of the muskoxen that draws me into the frame and has me lingering there.’” This image was selected for the Daily Dozen on September 13, 2018. — Top Shot features the photo with the most votes from the previous day’s Daily Dozen, 12 photos chosen by the Your Shot editors from thousands of recent uploads. Our community votes for their favorite photo from the selection, and the Top Shot is showcased on the @natgeoyourshot Instagram account. The online community National Geographic has built lives at the intersection of creativity, professionalism and social media. National Geographic is all about threading together tiny moments through photography. Followers learn about other cultures, examine nature through the camera lens and visualize the experiences of those around them regardless of time or distance. [ #YourShotFeatureFriday ] Divide | Photograph by Kathleen Dolmatch (@iluvtotakephotos789) . “This trip inspired me to make a point of capturing aerial images every trip I take. I also learned that you don’t need a magical sky for beauty to present itself,” writes #YourShotPhotographer Kathleen Dolmatch. “A day before my 27th birthday, I was in a helicopter looking south on Central Park West which divides the architecture and Central Park — the flight was my birthday gift. Taken with a Canon 5D Mark III and EF 24-70 f/4 IS USM lens.” — “I agree with #YourShotPhotographer Michelle Zheng (@the.michelle.zheng) who commented, “A brilliant capture of this dividing line between the two different worlds in NYC! It’s such a beautiful city and it’s lovely to see it from above! The brilliant autumn colours make a difference in making a photo look much more in-depth sometimes and you captured just that! Well done.” — @natgeoyourshot Producer David Y. Lee (@davidylee) . #YourShotPhotographer Kathleen Dolmatch’s photo won honorable mention in the cities category of the 2016 @natgeo Travel Photographer of the Year contest. Their posts often generate half a million likes and thousands of comments, showing the depth and reach of raw imagery sans text or a corporate goal. The Your Shot campaign is designed to spotlight foundational truths from around the world, like the innate beauty of a lakefront sunset or the motherly compassion exhibited by species of all kinds. If U.S. adults are spending 3 hours and 35 minutes a day on mobile devices, scrolling through the gallery of National Geographic photos is time well spent. Combine social media, a brand that knows their target audience and a fun, curated art installation, and you have Refinery29’s new 29Rooms popup. It’s part experiential marketing and part user-generated content. The installation features 29 rooms with custom exhibits from local artists and is designed to be an immersive multiseries gallery with explosive colors, unexpected showcases and even cocktails. One of the goals of this traveling pop-up is for attendees to take selfies in front of each exhibit, which is much too enticing for today’s smartphone-obsessed culture to resist. In addition to featuring up-and-coming local artists and promoting causes important to them (e.g., ending gun violence, advancing human rights and encouraging body positivity), 29Rooms has been called an “adult playground,” as visitors can interact with and experience artwork directly – much more so than at a conventional gallery. Refinery29 is able to quickly fill its social feeds with unique user-generated content that stands out while raising awareness for important causes. It turns followers into advocates and influencers. High-quality content is getting harder to create because the definition of “high quality” continues to inch upward. But access to web and social media analytics provides a starting point for brands to understand the types of content their audience enjoys. While much of our time in this post was spent discussing Instagram success, social campaigns aren’t limited to individual platforms. In the examples we chose to feature, these brands often determined Instagram was the channel of choice for their target audiences and sought to launch their campaigns accordingly. This rationale applies to your business as well. Marketing on platforms where your users don’t exist is a waste of money. And if you’re in the business of wasting money, then, well, you won’t be in business long.